Don Pardee Moon was born in Kokomo, Indiana, on 18 April 1894. While attending the U.S. Naval Academy he demonstrated special proficiency in ordnance and gunnery, fields that would occupy much of his subsequent Navy career. Following graduation in June 1916, Ensign Moon was assigned to the battleship Arizona and remained with her for more than four years. During this time he devised a number of instruments to facilitate ships' gunnery. In 1921 and 1922 Lieutenant Moon attended the Postgraduate School at Annapolis, Maryland, and the University of Chicago, then had ordnance assignments ashore. He served in the battleships Colorado and Nevada from mid-1923 until mid-1926 and spent most of the rest of the decade at the Bureau of Ordnance and the Naval Gun Factory, both located in Washington, D.C. Lieutenant Commander Moon was a destroyer squadron Gunnery Officer with the U.S. Fleet in 1929-1932, followed by instruction and staff duty at the Naval War College. In 1934 he became Commanding Officer of the Asiatic Fleet destroyer John D. Ford. Promoted to the rank of Commander in 1936, for some months in 1937 he commanded a destroyer division, then returned to the Naval War College to attend the senior course and serve on that institution's staff. In 1940 he was again placed in command of a destroyer division and, after attaining the rank of Captain in September 1941, moved up to command an Atlantic Fleet destroyer squadron. During the wartime year of 1942, Captain Moon's squadron participated in efforts to move convoys through the dangerous waters north of Norway and took part in the invasion of North Africa. From November 1942 to January 1944 Moon served on the staff of Admiral Ernest J. King, the Chief of Naval Operations. At the end of this tour he was promoted to Rear Admiral and placed in command of an amphibious task group. During the June 1944 invasion of Normandy he directed the landings on "Utah" Beach. At the conclusion of that operation, Rear Admiral Moon was sent to the Mediterranean to perform the same function during the forthcoming invasion of Southern France. Suffering from mental exhaustion brought on by his intense efforts to ensure the success of two very demanding amphibious undertakings, Rear Admiral Don P. Moon died by his own hand on 5 August 1944. An impeccable Navy career had come to a tragic end. Rear Admiral Don Pardee Moon, commander of a task force in the invasion of Normandy, had taken his own life. The Navy, announcing his death last week, did not say how or where, offered no explanation except "battle fatigue." Handsome, 50-year-old Don Moon, fourth in his class (1916) at the Naval Academy, served on a battleship in World War I, made his way quietly up the naval ladder between wars. In 1942, as commander of a destroyer squadron, he helped support the landings on North Africa and was officially cited for "exemplary conduct" and "leadership under fire." For Admiral Moon, as far many another officer, the invasion of Normandy was the high point of a career. He played his part with precision and assurance. Happily married and the father of four children, Don Moon was well-liked, a successful Navy man. What happened in his war-weary mind no outsider could guess. Though war has always had its combat suicides, Army and Navy annals record no precedent among officers of comparable rank. 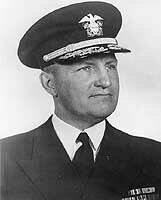 Don Pardee Moon (18 Apr 1894 - 5 Aug 1944) was a United States Navy Rear-Admiral who fought in the invasion of Europe. He was born in Kokomo, Indiana, USA. He married and had four children. He was appointed to the U.S. Naval Academy and graduated June 1916, being particularly efficient in gunnery. He was assigned to the battleship Arizona and whilst there developed several of instruments to improve gunnery. He later served in the battleships Colorado and Nevada before returning to shore in 1926. By 1934 he was Commanding Officer of the Asiatic Fleet destroyer John D. Ford. He was put in command of a destroyer division in 1940 and became a Captain in 1941. He took part in the Torch invasion of Africa in 1942. In 1944 he was promoted to Rear Admiral. During the 6 June 1944 invasion of Normandy he directed the landings on "Utah" Beach from USS Bayfield. For three weeks the Bayfield was in position of Utah beach and officers and men were on four hour rotating shifts for this entire time. Shortly afterwards the Bayfield was sent to Naples to for the invasion of Southern France. However on 5 August 1944, Moon shot himself with his .45 calibre pistol. His suicide was blamed on battle fatigue. He was buried in Arlington National Cemetery. He was survived by his wife Sibyl Moon and his four children Meredith Moon, Don Moon, David Moon, and Peter Moon. WASHINGTON, August 8, 1944 – Rear Admiral Don Pardee Moon, who commanded a task force during the landings in Normandy, ended his life Saturday. Secretary, Secretary James Forrestal said “with regret” today that “apparently Rear Admiral Moon had taken his own life as a result of combat fatigue.” No details were revealed. Admiral Moon, who was born fifty years ago in Kokomo, Indiana, left a wife and four children. On June 9 he commanded the naval forces on the east face of the Cherbourg Peninsula, under Rear Admiral Alan G. Kirk. The next day a commique revealed that during the night, destroyers under the command of Admiral Moon intercepted a force of heavily armed enemy craft between the mainland and the Isles Saint-Marcouf, and drove them off. The admiral had also received a commendation for his work as commander of Destroyer Squadron 8 during the attack upon and the occupation of French Morocco from November 8 to November 11, 1942. Rear Admiral Moon was graduated fourth in his class at the Naval Academy in 1916. The officer served throughout the last war and until 1920 on the battleship Arizona. In 1920-21 he received post-graduate instruction in ordnance at the Naval Academy and at the University of Chicago. During the next three years he served on the Colorado and the Nevada, and in 1926 at the Bureau of Ordnance, Navy Department. From 1929 to 1932 he was squadron gunnery officer of Destroyer Squadron 11. In 1933 he was at the Naval War College. From 1934 to 1937 he commanded the John D. Ford, operating in Asiatic waters. Rear Admiral Moon completed the Senior Course at the Naval War College in 1938, and served on the staff for one year. After that he commanded Destroyer Division 16, battle force and Destroyer Squadron 8 until November 1942.